My blog, 278toBoston.com is named for a reason that most of you understand. To be honest, it has really helped keep me in line and give me motivation over the past year or two. I struggle in two main areas. When I weighted 278 lbs, I never thought I could lose that weight. I honestly thought I’d die of some heart related disease and everyone who got on to me about my weight would say, “See I told you so.” I had a hard time with long term goals. Losing 100 lbs wasn’t possible. Running a marathon as my dad had, wasn’t possible. Living a normal healthy life after 50 wasn’t possible. After all, not only was I obese, but I had hip and leg problems. In fact my legs and ankles were beginning to swell and just walking up the steps was a difficult task. One day, on an 11 hour drive home from visiting Chicago (the “fat” pic on the side of this blog was taken that weekend), I had to drive the whole way home and couldn’t stay awake. I almost couldn’t make it home. I had to stop twice to sleep. Ends up I had severe apnea. At my sleep study I was told that I stopped breathing 110 times in an hour. Seasons of change come and go. I’ve learned over the years that when a season of change (a good change) comes, I need to take it and run with it or it will pass me by. In a season of change, I went to a Dr. appointment with my Lovely Wife and that doctor helped me. I lost weight, I began running, I lost more weight, I began racing, and finally ran a marathon last September. To be honest, I still struggle with weight and goals. My weight is consistent, but is about 10 – 15 lbs over where I should be. My goal (in my blog name) of making it to Boston one day seems but a dream. It can get so overwhelming. As I was running a few weeks ago, I was in a new neighborhood and ran past a house with a teen boy kicking a soccer ball. As I ran past, he waved and said hi and I returned the greeting. I thought, “How nice! Most kids look down and ignore me as I run, but he said hi and smiled”. A few days later I was running by the same house. 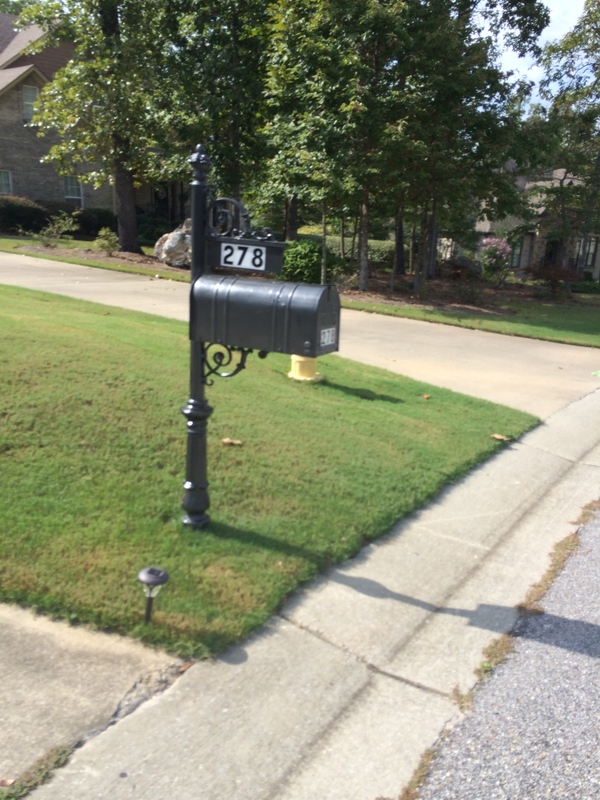 That boy has not been out since, but as I ran by I noticed his mailbox. This entry was posted in Boston Marathon, Diet, Marathon and tagged Boston Marathon, Lovely wife, marathon, running, Weight loss. Bookmark the permalink. This gave me chills. I am so proud of your accomplishments and to have you as a blog friend. You inspire me and so many others. This is why I wanted to coach. I want to encourage and grow a community of runners starting with those who think they never could do this. Love this post! Thank you so much. That means a lot coming from a coach. I truly wish I had access to a coach and wasn’t trying to do this on my own, but alas, we live a bit too far out of the city for that access. Anyway, thanks for your inspiration also. Your blog posts always help me!! I tend to not believe in signs (sorry, so not religious), but I do think it might’ve been your subconscious noticing something because you’re ready to take a leap. Beautiful post. Inspiration can come from anywhere, can’t it? I know. Who would think a mailbox would give hope. :). I hope all goes well for your stepdad. You can do it. Take whatever encouragement comes your way to support your goal and your plan to achieve it. I read once that there are 2 ways to get into Boston – A) get older B) get faster – I went with C) both! After many years and interruptions of different kinds and severities, I finally BQ’d in March of this year and am registered for Boston 2015. I can still hardly believe it. I wish you all the best! Wow, that is great. Congratulations!!! What a great experience it will be. Wise words of encouragement. Thanks!